Polycystic ovarian syndrome is the commonest endocrine disorder, and a major cause of anovulation, in women of reproductive age. Patients with this syndrome may suffer from oligomenorrhoea (infrequent menstruation), anovulation, infertility, hirsutism (excessive hair growth), enlarged polycystic ovaries, insulin resistance and hyperinsulinemia and obesity. Although the primary defect remains unclear, genetic factor is suspected to play a role in the etiology of the disease. About 75 % of anovulatory women demonstrate polycystic ovaries. 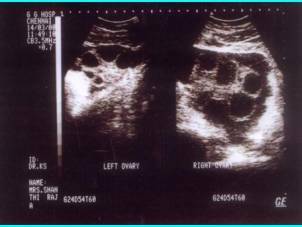 The ultrasound diagnosis consists of the presence of increased number of ovarian follicles arranged in a necklace pattern along with an increase in ovarian volume, largely due to an increase in ovarian stroma. About 8-25 % of normal women will demonstrate ultrasonographic evidence of polycystic ovaries. What has been increasingly recognized is that, PCOS is associated with insulin resistance and compensatory hyperinsulinemia in 30 – 60%.This is especially seen in women with high body mass index. The main treatment measures include weight loss, insulin resistance modifying drugs such as metformin/pioglitazone and laparoscopic electro coagulation of ovarian surface. All these treatments are mostly individualized depending on results of investigations. Many of these women benefit primarily by weight reduction along with ovulation inducing agents and in certain population of them, assisted reproduction.